Presented here are photographs of Capitaine Louis Barnet (1820-1898), of the 40eme de Ligne during the Second Empire.He is a typical example of an officer who worked his way slowly, but surely up the ranks. 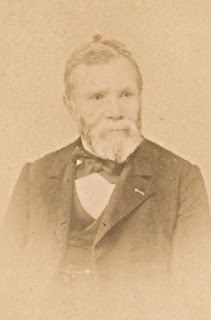 Louis Barnet was born in Paris, 19th June 1820 and died 31st October 1898 at his home, 50 Avenue de Wagram, Nueilly-sur-Seine int he department of the Seine. He was awarded the Legion d'Honneur with the rank of Knight (Chevalier) 7th April 1865. He served during the Franco-Prussian War and was awarded an annual pension of 250 Francs by the Legion d'Honneur from 12th December 1871. It was paid in half-yearly installements from 1872 (first payment made 1st January) and the last payment was made in the second half of 1885. A reservist, c.1870. He retired from the army in 1867. Photographed in 1865 (L) and 1864 (R) Capitaine of the Voltigeur Company, a rank and position he attained on 24th August 1863. 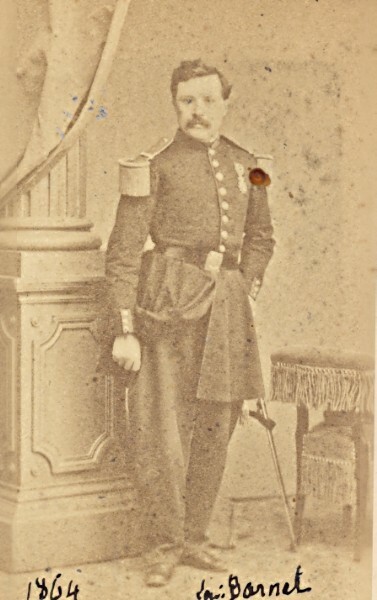 Lieutenant of Voltigeurs (promoted 1854) photographed here in 1862. 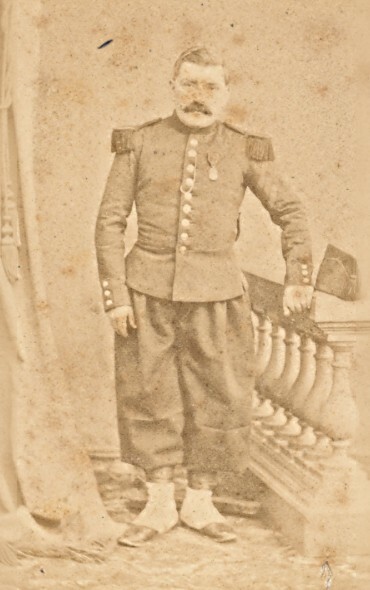 He had been promoted Sous-Lieutenant from Sergent-Major in the 40eme 30th September 1850 aged 30. Do you know if Barnet saw any active service in 1870-1871? He would have been 50 and, given France's acute shortage of officers after Sedan, I would not have been surprised if he had been recommissioned and given quite a senior job. I've no idea, Charles,but I have found him listed as a Captain in the 40eme in 1870. Alas I can't find any Annuaires de l'Armee post 1870! His file in the archives of the Legion d'Honneur show he was born in Paris on 19 June 1820. Was promoted to Captain 1863; awarded the Legion d'Honneur (Chevalier)7 April 1865 and died 31st October 1898. Thank you, Anthony. In my previous post, I referred to Barnet being “recommissioned” because the photo of him as a reservist in 1870 clearly shows him wearing an Other Ranks uniform. It is strange that he didn’t retain his commissioned status during his service in the reserves. Is it possible that the 1870 photo is not of Barnet at all, but another soldier? I've not come accross any evidence of "recommissioning". 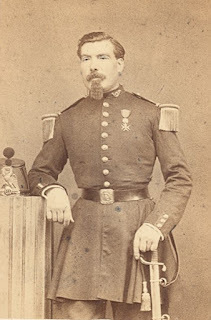 In the Annuaire of 1870 his rank of Captain is dated 24 August 1863 and on all his paperwork in the Chancelry of the Legion d'Honneur that is the date quoted too. It's possible that it isnt him dressed as an other rank but there are some facial similarities and it has his name in the same crabbed writing on the back as on the other images. 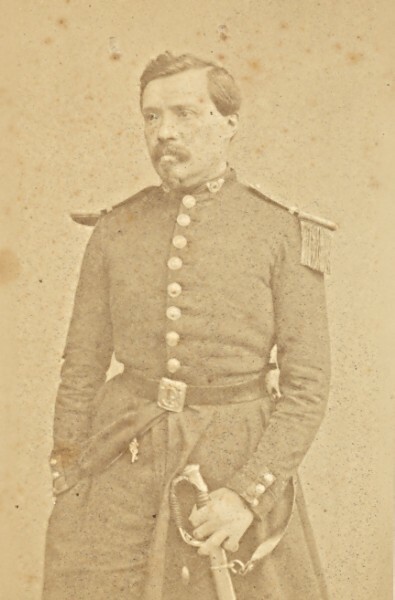 However, one of his photographs of him as a Captain has the date 1864 written on it but we know he was awarded the Legion d'Honneur in 1865 - but if he was going through his photos identifying himself and others at the end of a long life, being a year adrift isn't so bad? I've previously posted other photographs taken for Barnet on this blog. According to the material in the Chancelry of the Legion d'Honeur he retired in 1871 which is when he started to draw his Legion pension. The way to find out is to locate his file at the French Army Archives at Vincennes. Thanks again, Anthony. I was going to suggest Vincennes. Sadly, personal circumstances don't allow me to get over there at the moment, but as and when I can, I should be happy to look up Barnet's file for you. Thats a very generous offer! What aspect of the Franco-Prussian War are you studying? My own research is the Crimea - obviously - studying the logistics and management, the often over-looked part of military history but without either the battles couldn't be fought! Anthony,thanks. I will reply to this separately by e-mail, tomorrow I hope.